My first experiences of using Windows Phone Mango were not very good, because the LG device I tested was unreliable, and often sluggish in performance too. Now I have had chance to try two newer WP 7.5 (Mango) smartphones, and I am fairly optimistic about the platform. First I got to try HTC Radar for over two weeks now. It has been reliable and smooth. I haven’t experienced any of the problems I had with the LG device. A few of my friends commented they have had the same LG E900 model without same kind of problems. So I may have had an unlucky bad sample from the factory. HTC Radar has the basic specifications and nothing special. The aluminum unibody chassis has the same feeling and style alike many others, such as Nokia N8. I think the gray and black colours are boring. CPU is the minimum required for WP 7.5, Qualcomm Snapdragon based Scorpion running at 1 GHz, but I haven’t experienced any performance problems. However, there’s one major disappoinment, the camera: HTC has never put very much effort in this area, and HTC Radar is even worse than many others. Especially in low light and with the LED light results are awful. HTC Radar is a no surprises business phone with a decent 3,8 inch screen. I can recommend it, if you get a tempting enough price offer. I would not pay very much for this, because better options are on the way soon. The second Windows Phone 7.5 smartphone I played with is the highly anticipated Nokia Lumia 800. Microsoft held two events, Hello Helsinki for consumers and TechNet for developers and IT pros. There I had the chance to try Lumia 800, but just for about one hour, in two sessions. Even though Lumia 800 does not yet bring anything very special to the Windows Phone platform, I have to say it’s absolutely the best looking and feeling Windows Phone device so far. It’s almost as great piece of art as Nokia N9, and somewhat even better. Lumia 800 has got very good reviews online. Many have written it’s probably the best smartphone Nokia has ever done. Of course, it’s good to note Americans haven’t got most of Nokia’s smartphones to the United States, and it seems they never got used to Symbian. Nokia N9 (MeeGo) is not shipping there either. Lumia 800 has the same kind of nice polycarbonate chassis as N9, which means a special quality of plastic. In this case plastic is not a bad thing, because the device feels very robust and sturdy. And the material enables having very vivid colours of cyan, magenta and black. And if you scratch the device, the colour surface should remain the same, because all of the plastic material has been painted. The last argument is from Nokia, I haven’t actually seen that in real life yet. 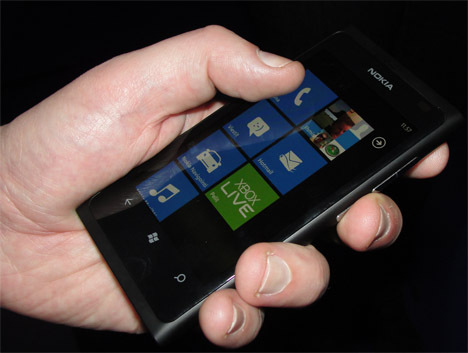 Nokia Lumia 800 contains the same physical size as Nokia N9, but the display is only 3,7 inch diagonal, compared to 3,9 inch of N9. Lumia 800 has one benefit, a special camera button, which also works when the device is in device lock mode (thanks to Windows Phone). Nokia has put some unique software features, such as an online radio music player, and most importantly, a full car navigation software with voice guidance. Looking at hardware specifications, Nokia Lumia 800 is not the best WP Mango device available. HTC and Samsung have models with front cameras for video calls. HTC Titan also boasts an impressive 4,7 inch screen and faster Qualcomm Snapdragon 1,5 GHz processor. I was disappointed to note Lumia 800 uses the same, very modest standard camera application of the Windows Phone platform. As mobile cameras are Nokia’s core know-how, I would have expected them to shine in this area with the same kind of an application we’ve seen on MeeGo and Symbian. I took a few pictures live at the event, but I couldn’t figure the image quality based on that yet. However, in those dim light conditions the result did not look as good as what I’ve used to with N8 and N9 based on what I saw on the screen. 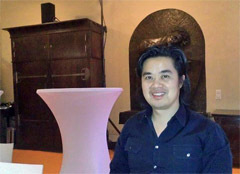 Albert Shum was a keynote speaker at the Microsoft TechNet event. There was a whole one day track about the Windows Phone UI for Finnish developers. It’s clear Nokia can do a lot better than what Lumia 800 shows, and fortunately they are already working on this. I got to meet Albert Shum from Microsoft at the same event. He is the man responsible for the Metro UI of the Windows Phone platform. Shum told they have very close co-operation with Nokia. He has described his work on this YouTube video. Even though Shum obviously couldn’t reveal any specific new features of future Nokia device, based on the interview I’m convinced we will see more personalisation and more features specific to Nokia. The camera application and integration to other parts of the OS are important. People centric features will become even more advanced. IM and VoIP will be integrated with Lync and Skype support. Lync should come already before the end of this year, for Skype the schedule is more uncertain. You could possibly see where people are, what they’re doing. invite them for a coffee based on your map location, or pictures taken with the camera could be shown on your map location, et cetera. It’s also interesting to see which features will be specific to Nokia, and which ones will become available for all the vendors. I will blog more about the interview with Albert Shum if I have time later. 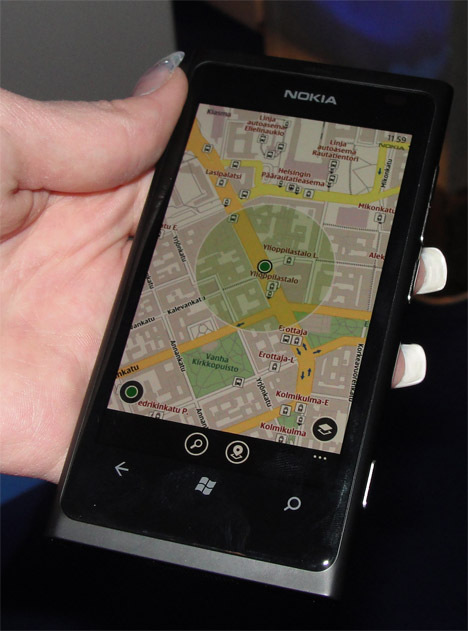 Nokia Maps was already available for download for Lumia 800. According to Nokia, it will become available for other vendors' Windows Phone smartphones too. I tried Lumia 800 for a while at the Microsoft event. It was nice, but I still think N9 is better, not just the hardware (larger display), but the software too. WP Mango is like smartphones for dummies. That’s cool for my mom maybe. I want to be able to do more. MeeGo is great for that. I don’t get why Nokia would not support both, because there seems to be demand for MeeGo too.